An early 1830’s white cotton and eyelet trimmed dress. The dress is all hand stitched. The front and back of the bodice has soft gathering and a center band of eyelet trim. The shoulders, sleeve cuffs and skirt hemline are decorated with the same eyelet trim. The neckline, shoulders and armscyes are all piped. The bodice has a back hook and eye closure and is partly lined with linen. The lower edge of the skirt has four rows of wide pin tucking. The dress is in very good condition. There are a few scattered tiny age spots and two small ¼ inch splits on the lower edge of the skirt. Antique clothing is for display/collecting and should not be worn. Bust 32 Waist 26 Skirt length 39 ½. 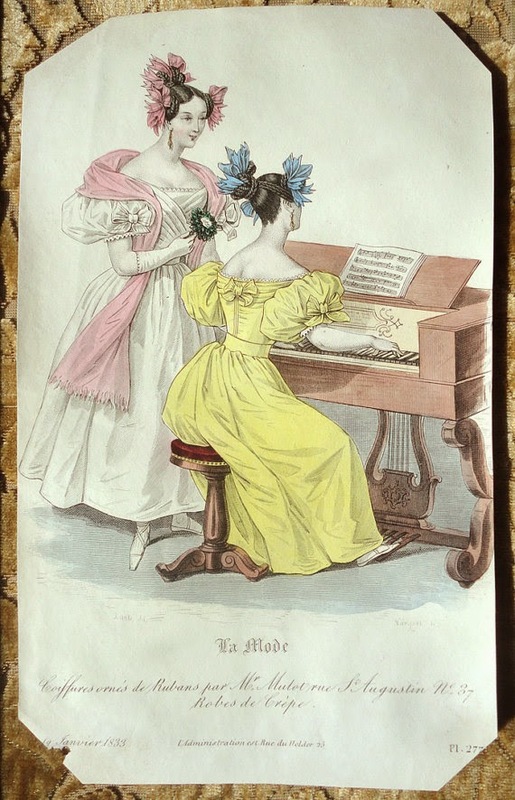 The above is a fashion plate from 1833. Nice! Do you think the hooks and eyes were added later? It's hard to tell from the photo. I've certainly seen dresses from this period and a bit earlier with hooks and eyes so it wouldn't be incorrect.